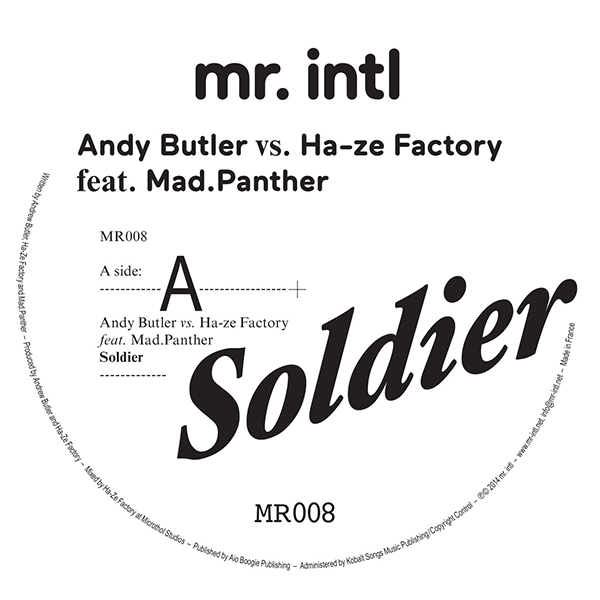 Hercules & Love Affair’s main man Andy Butler delivers another killer single for his relaunched mr.intl label. The A Side ‘Soldier’ is a co-production between Andy Butler & Ha-ze Factory (Constantin Zeileissen & Philipp Haffner) and features Mad Panther (aka Cleo Panther) on vocals. A infectious, bumping mid-90’s New York inspired House groove underpins Cleo’s powerful torch-like vocal. A sure fire killer of a track! On the flip, Ha-ze Factory team up with the legendary Tin Man (Johannes Auvinen) and get deep and ominous, delivering another timeless classic underground tough-jam complete with modern twist. It’s a great double-header of a release.